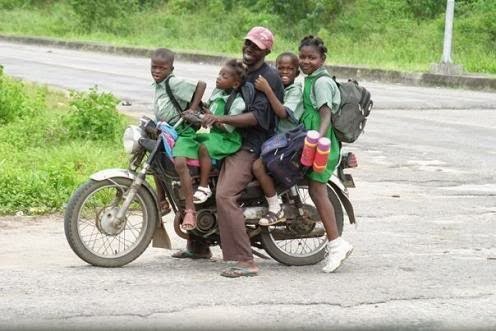 This Okada (motor cycle) rider will probably make it from the school to the house (or vice versa) in eight minutes. Around the world in eighty/80 days…I love the phrase, the cartoon and the movie. But for this blog post it’s more like around Nigeria in eight days. As you can guess I’ve been on the move a lot in the past few days, crisscrossing different places in North Central and South eastern Nigeria (six states in all in addition to the F.C.T.) that I’m almost beginning to liken myself to the PDP presidential campaign team in last month’s general elections. These are the places I’ve touched: Abuja, Nassarawa (passed through Keffi, Akwanga and Lafia), Benue (Markurdi, Katsina-Ala, Zaki-Biam, Gboko), Enugu (Enugu, Obollo Afor, Nsukka), Anambra (Awka, Aguata L.G.A. ), Ebonyi (Abakaliki) and Kogi (passed through Ayangba, Ajaokuta and Lokoja). So what was the reason for my travels? Uhm…to attend to important matters of personal interest. Anyways here’s stuff I’ll rather talk about: contemplations from the travels. From the much I’ve taken-in in the last eight days I think writing a book on the living, farming and public transport habits of people in North Central and South Eastern Nigeria is in line. Right now I’m a mobile uber store of knowledge that it’ll be a shame if I don’t bequeath some of my knowledge to humanity…I’m just kidding…partially. The provision of good (tarred) roads…and social amenities in general to the citizenry by the government makes a big difference to the psyche of the people. It determines how happy, patriotic and cooperative they’ll be, how well they’ll get along with each other and how crude or morally upright they’ll become. It’s no wonder then that a lot of Nigerians don’t wear their national team’s jerseys or bathe themselves in national colours during Super Eagles games. They instead prefer to drool over European soccer because that’s a more mutually benefiting investment (top quality football in return for getting high off the passion and fun of the most beautiful sport on earth). Abakaliki the capital of Ebonyi State surely is one of the neatest towns in the South East! Yes where I visited was around the Government/State House environs (situated in the heart of town) but intuition leads me to believe that places far off wouldn’t probably be different. Having grown up in Abuja and being used to impeccable surroundings I’ll choose to set up shop from scratch in Abakaliki any day over taking a free house in Enugu, Awka, Nsukka or Onitsha (those places are crowded and dirty!). Forget the fact that we’ve got new, crisp and clean Naira notes; they’ll all eventually get soiled because of the inherent "dirt" in our monetary exchange system. From the drivers, conductors, bus stop and motor park hustlers living from hand to mouth, to the youth corper working for peanuts and still having to fight before giving his rightly due peanuts and the benefits attached therein, and on to the project manager having to deal with the issue of productivity on one hand and the major expense of paying staff salaries on the other hand. Despite all of that there’s still a feel good feeling attached to being hailed and respected as a big boy because you’ve got money to spend on others. Last point, a cardinal rule to follow when setting up a cyber café is to make sure your business quarters is spacious. Surfing is like working, it’s best done in a conducive environment, and if you want to stand the test of time such an environment must not only be good enough for the average chat-freak teenager but also for a top business executive. Avoid too many system restrictions and do carry out maintenance work on your systems on a regular basis. And off course customer service must be top notch and very professional. "...Uhm…to attend to important matters of personal interest..."
ol' boy, I de jealous o! Traveling is one of my hobbies and i know I've not done as much of it as I'd love to. Glad u got around that much...you should plan going to the west on your next itinerary. And no doubt about infrastructure affecting the general orientation of a constituency. Karmo (before it was Rufaid is a good example), and of course like you pointed out in those other major Eastern cities. you crack me up! i just came across your blog/site in a very non-related google search! i read about your world cup/football woes, I'm Ghanaian & checked out your "internet worthy" photos. dude, you have a very interesting site. keep doing what you're doing & Africa's pretty small so we might bump heads one day. besides my girl is Nigerian so i'll be popping in & out regularly. PS> sorry to hear about your Momsie. @ayigbeboy: thanks man, you're cool yourself; shoutout to the wifey. @Yosh:yeah, i plan to visit OBJ at his chicken farm on my next trip :).